For the first time in months, we got our little barbecue back up and running, crackling and smoking wildly, sending delicious aromas throughout the neighborhood. 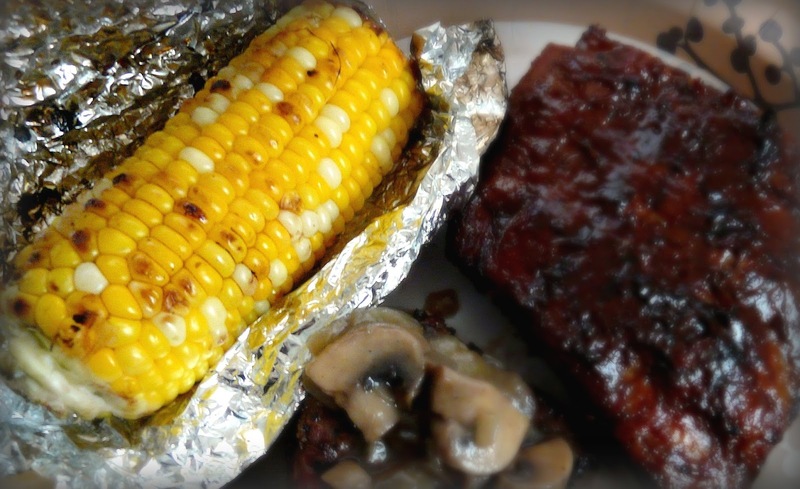 We threw some baby back ribs on it along with thick tri tip steaks and gorgeous corn on the cob. We also roasted some asparagus in the oven and made a mushroom and onion sauce to spoon over the steaks. It was pure BBQ bliss! I'll save the mushroom sauce recipe for another post but here's everything else. First up on the menu -- corn on the cob. 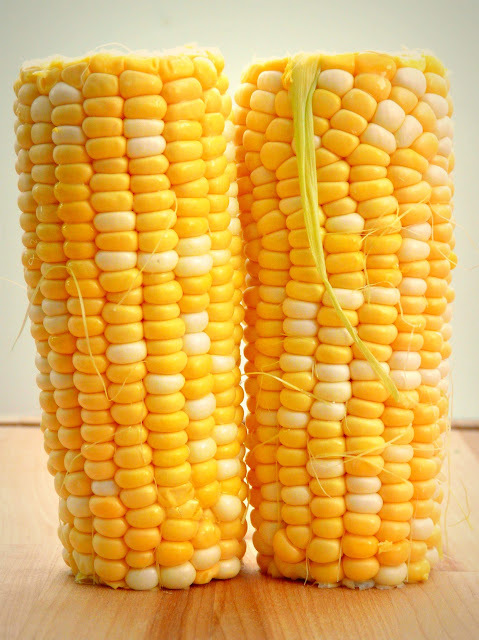 They weren't just regular white or yellow corn but a hybrid variation with both yellow and white kernels. Aside from being beautiful to look at, they were simply delectable. We merely wrapped them in foil, cooked them on the grill for about 20 minutes and allowed nature to treat us to its wonderful sweetness and juiciness. Nothing says summer like sweet corn. Can you see the sweetness? Oh yes you can! 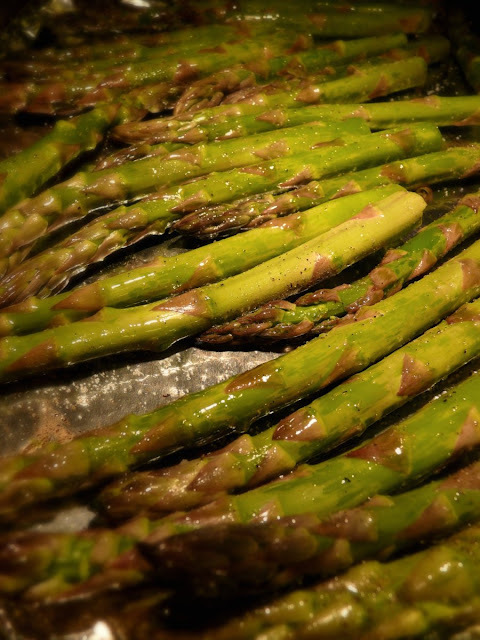 We also had asparagus since tis' the season for asparagus. 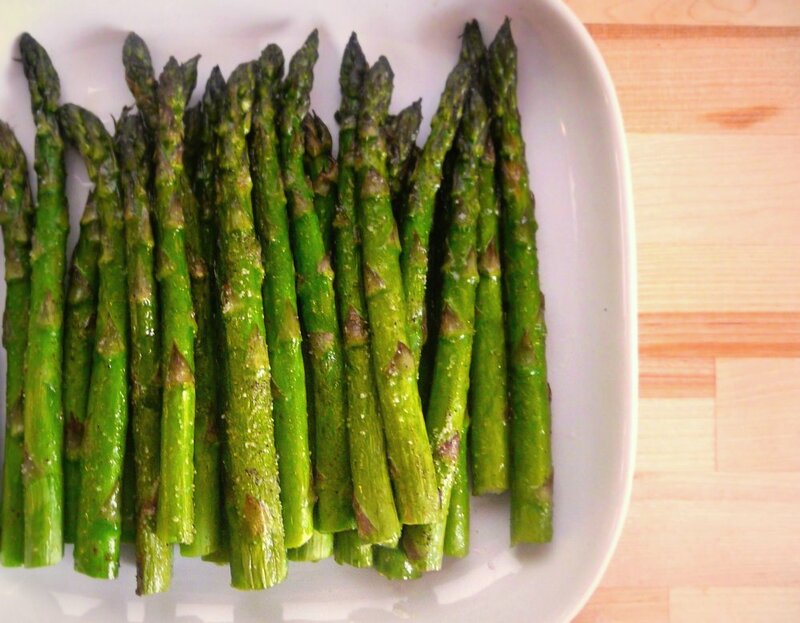 It's another vegetable I love and my favorite method of preparation is to simply roast them in the oven with a drizzle of olive oil, salt and pepper for about 5 to 10 minutes. This brings out their nutty flavor and natural sweetness. Asparagus seasoned with olive oil, salt and pepper roasting in a 425 degree oven. Oven roasted: Sweet, nutty and a tad crunchy. Mmm! Next up are the ribs! I haven't had ribs in awhile especially since I've been trying to cut down on meat consumption. 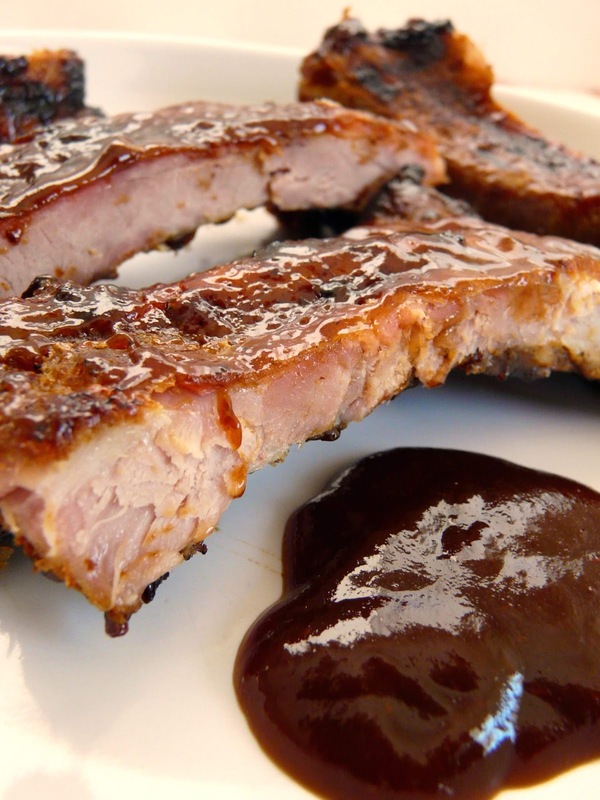 But I won't deny that I've thought often about eating ribs so as you can imagine, it was a real treat for me. Left to right: Seasoned with garlic salt and pepper then smeared with BBQ sauce, marinated overnight, then baked for a long time in the oven. I seasoned them with a generous amount of garlic salt and pepper then smeared BBQ sauce on them (I used KC Masterpiece Private Stock Reserve -- ooh, how fancy sounding, no?) and then marinated them overnight. 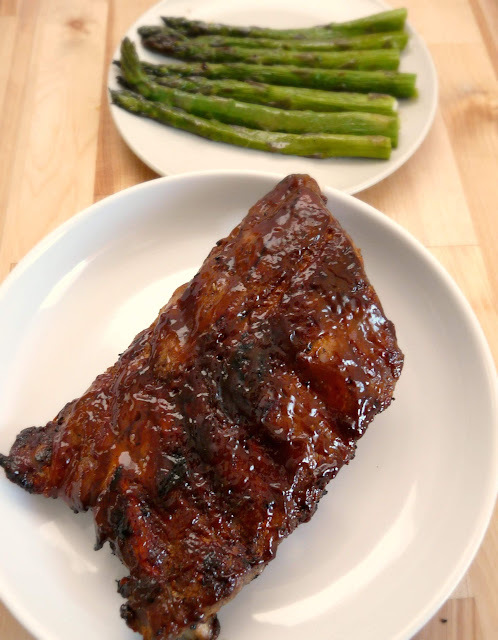 In the past, I've always boiled them in seasoned water on low heat for several hours to get them to a fall-off-the-bone state but this time, I decided to try baking them as I had heard that this method would also yield super soft ribs. So with the temperature set to 250 degrees, I transfered the ribs to a large pan, covered them tightly with foil and then popped them in the oven for 4.5 hours. The meat turned out to be soft and tender but not fall-off-the-bone soft. Maybe it was because I had a whopping three racks of ribs in the oven at the same time so I probably needed to cook them even longer to achieve that texture. Regardless, it was dinner time and with hungry people waiting for some ribs, they had to come out of the oven and onto the grill. Once on the grill, they were slathered with a good amount of barbeque sauce and then allowed to char a little to get that nice smoky flavor. And then, it's chow time! Hooray for summers and barbecues! wow, 4.5hours, that very long hours! I bet it taste super yummy!